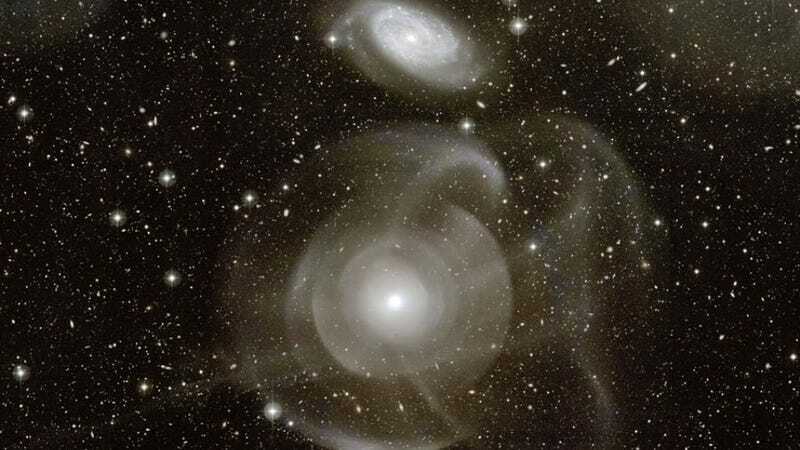 In the prevailing view, elliptical galaxies are long-dead places, full of stars that are all at least seven to ten billion years old and without the gas needed to form new stars. The truth may not be that simple. The multiple layers of emission appear strangely complex and unexpected given the relatively featureless appearance of the elliptical galaxy in less deep images. The cause of the shells is currently unknown, but possibly tidal tails related to debris left over from absorbing numerous small galaxies in the past billion years. Alternatively the shells may be like ripples in a pond, where the ongoing collision with the spiral galaxy just above NGC 474 is causing density waves to ripple though the galactic giant. Regardless of the actual cause, the above image dramatically highlights the increasing consensus that at least some elliptical galaxies have formed in the recent past, and that the outer halos of most large galaxies are not really smooth but have complexities induced by frequent interactions with — and accretions of — smaller nearby galaxies. During this major event, part of the matter of the galaxies in "collision" was ejected and formed stellar debris. The filaments of gas and stars, which have been detected by the CFHT, form two long tails on either side of the galaxy, extending over more than one million light years (more than 10 times the span of the Milky Way). It is the largest stellar structure ever detected, although it has not been revealed before due to the low surface brightness and considerable spread of its filaments. These filamentary structures were formed during encounters between spiral galaxies, by a gravitational mechanism similar to that of oceanic tides, hence their name of "tidal tails." Image by Pierre-Alain Duc via NASA.